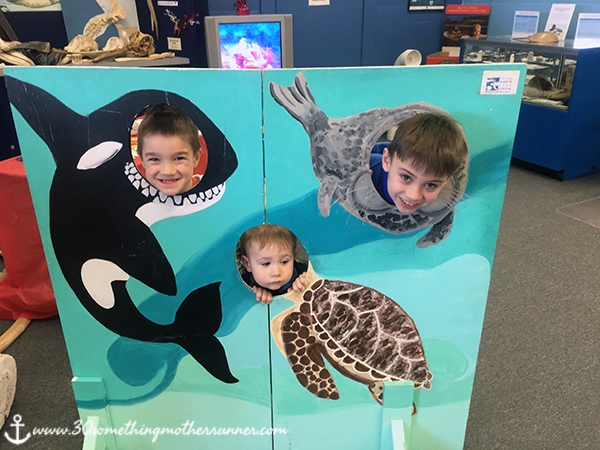 A Trip to the National Marine Life Center in Buzzards Bay! I have been meaning to visit the National Marine Life Center for a while now, and February vacation presented the perfect opportunity! 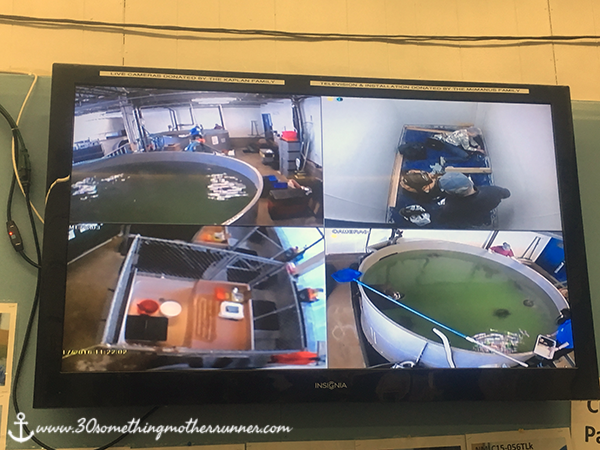 Yesterday, we headed over the bridge to learn more about the rehabilitation of sea turtles and seals and how they are cared for at the center. Since it was a school vacation, there were a number of scheduled activities for kids throughout the day. 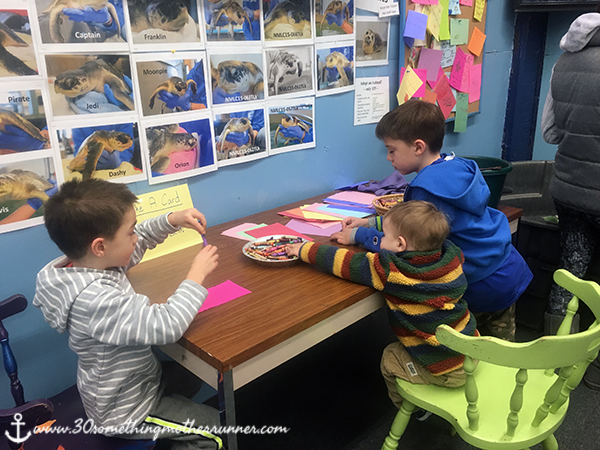 Much to my surprise, my kids were so into the center activities that they decided to pass on the scheduled 11:00 a.m. Little Flippers Story Time and Craft class. The class features a story and craft (topic varies depending on the day of the week). The price for a drop-in class is $5, completely reasonable in my opinion, and of course it benefits a very worthy cause! 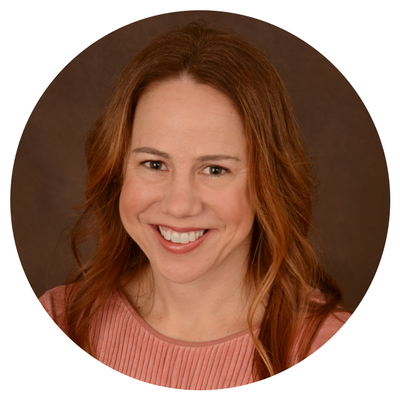 The National Marine Life Center is an independent, non-profit (501(c)3) organization established to help care for stranded marine animals and to educate the public about marine wildlife health and rehabilitation. Rescued marine animals are studied, rehabilitated and released. 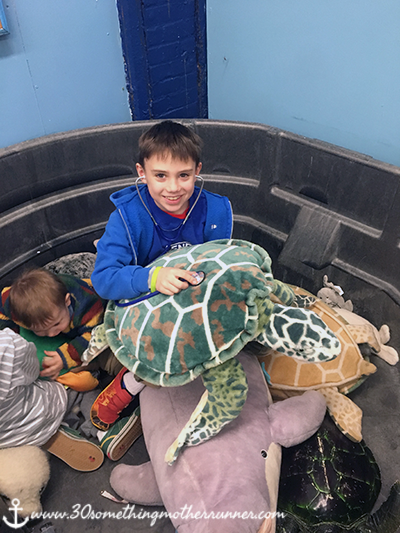 Stranding of sea turtles (including the endangered Kemp’s ridley sea turtle), dolphins, seals, whales, and porpoises is not uncommon here on Cape Cod, and the National Marine Life Center has been busy helping marine life since 2014. 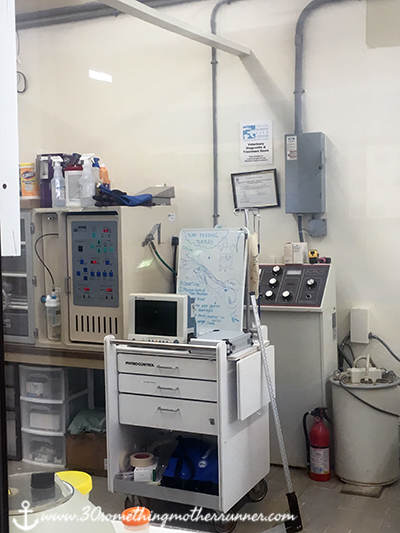 When you enter the National Marine Life Center, you will find yourself in the Marine Animal Discovery Center, a large open room that is adjacent to the veterinary care building. You cannot see any of the animals at the facility in person, but you can view them on the closed circuit television in the discovery center. Watching the rehabilitated marine life on closed circuit television! There is a giant tub with stuffed sea animals that kids can take care of with toy stethoscopes and other veterinary equipment. There are several scavenger hunts, a sand play area, and coloring activities. I love that they have a table where you can make get well cards for the wildlife currently being rehabilitated at the facility. Making get well cards for the current sea turtle and seal patients! Giving a sea turtle a check up! The center is open Memorial Day Weekend through Labor Day, 10-5 daily, then weekends through Columbus Day, in addition to school vacation week! Admission to the National Marine Life Center is free, though you can make a donation if you enjoyed your visit (more on different opportunities below). The discovery center is a great place to learn about what the National Marine Life Center does and its many patients. The National Marine Center has a number of programs that you can schedule at their location or your own. You can see the list HERE. There are also drop-in programs that are occasionally scheduled during other times like school vacation weeks. You can see the February break daily activities HERE. There are a number of different ways you can help support the National Marine Life Center. You can visit the discovery center and learn about the great work they do and help educate yourself and others. Additionally, you can make a donation while there. There are a number of different ways to contribute. You can purchase a membership to the center, make a one-time donation, or even adopt an animal. They also have a cute little gift area where you can purchase marine life merchandise on your way in or out. We had a great time visiting the National Marine Life Center, and I’m happy we finally made it there! All three boys had a great time, and I’m sure we will be back! It’s a much-needed resource here on the Cape, and I love their educational initiatives! Bonus: there’s a great little Thai place (Krua Thai) where you can take out right next door!